During ten years of living outside of Canada I found that I took pictures of walls as much as scenery. I mean not only the walls that sheltered me but also the walls whose doors I sought. The long walls of the narrow streets of Lamu, behind which life went on in interior courtyards. The mud walls of homes in Kakamega. The whitewashed walls in residential neighbourhoods of New Delhi. The art-deco walls of Viennese apartment buildings. The walls that prevented me from seeing where I was going and along which I still get lost. The photo to the left was the view from my apartment in Vienna. It shows less than half of the Flakturm that sheltered the playground in Arenberg Park. Every day for four years I would look out the living room window at the ten stories of thick concrete walls, which emanated a dank odour. 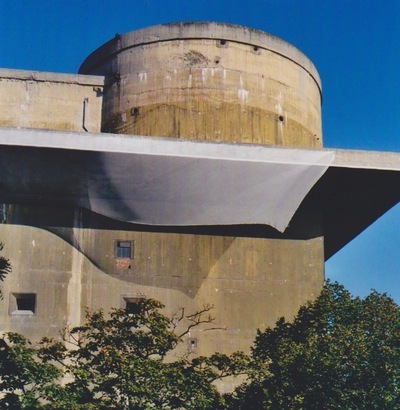 A multi-purpose building, it served primarily as an anti-aircraft tower or flak tower, with military beds, a hospital, a bomb shelter and in the basement, a munitions store. Built by the Nazis to last 500 years, it cannot be destroyed. Every day several times a day, this wall forced me to remember the Second World War. You have already guessed that this talk of walls is, well, a wall that I am throwing up around my real point. People can erect invisible walls around themselves, and groups of people erect hidden walls against foreigners. Customs, language, rules, history. Difference fascinates us, but it can also keep us out. The trick is to find the way in. 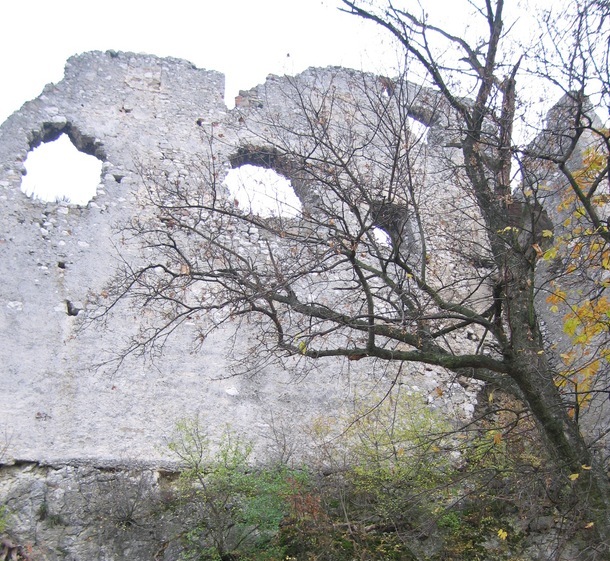 Eyes on the world – these holes are in a wall of the Falkenstein ruin in Austria.